You look like a cowgirl lady. Greetings. I think you've reinvented the cowboy look with elegance, dear friend. I'm in love with each garment that you look here, from the wonderful embroidered blouse to the nice bag, absolutely everything !! Thanks for joining us. So pretty! 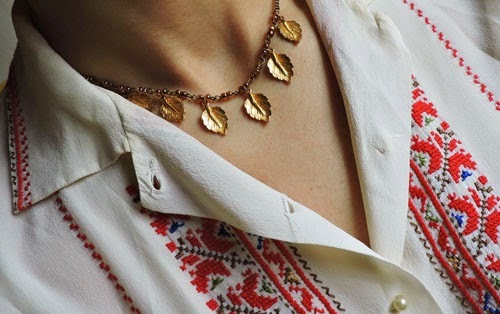 Your vintage leaf necklace is so pretty! Often one sees this style with fairly big leaves, which is great as well, but I really, really like this smaller style. I tend to be drawn to delicate/petite jewelry, as I'm short and bigger pieces can sometimes overwhelm me. I really like the western inspired details in this outfit! It's just so cute! I think your vintage wool coat is wonderful too! Deine Bluse ist sehr chic! Gefällt mir sehr gut! Your Grannys blouse is so very pretty. I love the delicate embroidered details. You have pulled the look together splendidly! What a fun coat, it's great! You know I LOVE cowgirl looks! It's interesting you saying that you think of cowgirl looks being a style for summer. I love it during fall and winter, because of the boots, jeans or wool pants, and fringe leather jackets and sometimes a hat!